Krill are a small semi-transparent crustacean like a shrimp, about 6 cm (over 2") in length and a gram in weight when fully grown, they can live for up to 7 years which is quite remarkable considering the wide variety of animals that feed on them in huge quantities. Krill belong to the animals that make up the zooplankton. The "zoo" means that they are animals, the "plankton" means that they float in the upper reaches of the water column and are at the mercy of the ocean currents, being able to change their position in the water column, but not able to swim against the current or migrate in the normal sense. Krill feed on microscopic phytoplankton ("phyto" - plant) that are extremely abundant in Antarctic waters due to the great upwellings of deep waters at the Antarctic convergence. 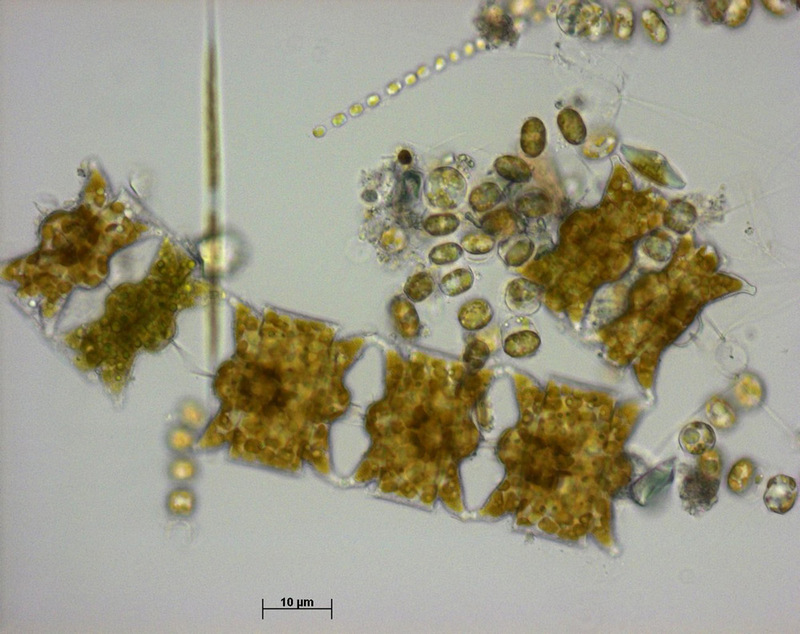 These upwellings bring with them great amounts of dissolved nutrients, especially nitrate and phosphate that fertilize the microscopic but hugely abundant phytoplankton in the same way that a farmer puts fertiliser on the fields. Add to this the 24 hour sunlight of the summer months and the scene is set for a super-abundance of life despite the ocean temperature being just a couple of degrees above freezing point. Krill are unusual in that they are so super-abundant and relatively large when compared to other phytoplankton feeders in other oceans. This means that many large animals such as seals, penguins, whales and myriad other birds are able to tap the food chain close to the producers (phytoplankton) before energy is lost in intermediate stages, so the Antarctic supports a large population of large animals. Krill they drift around in swarms that are so large it is difficult to imagine. They are usually either not in a particular area at all or are present in huge quantities. Swarms estimated at containing 2 million tons of krill spreading over more than 450 square kilometres have been observed. This is the equivalent biomass of 28.5 million human beings, approximately 4 times the population of Greater London or the entire population of Canada, averaging 70kg each, in area a third that of Greater London - or 12 times the human biomass density of London (which is a busy place!). The krill population of the world has been estimated at outweighing the human population, about half of this population is eaten each year by whales, penguins, seals, fish and pretty much every other Antarctic animal that is larger than them. They are then replaced by reproduction and growth. 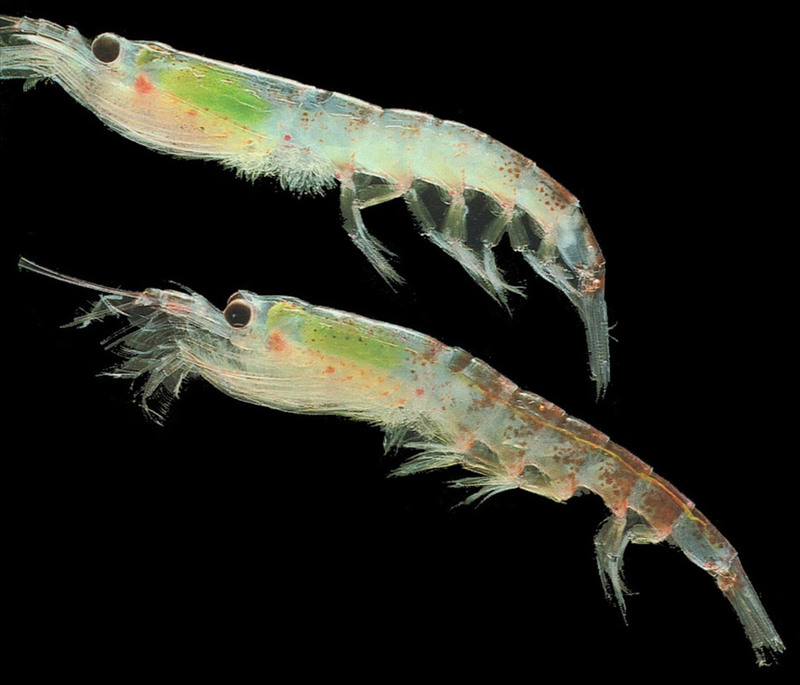 There is a very complex ecology that has arisen involving krill and krill predators, with different species of predator feeding at different times of year at different depths and on different sizes and therefore age groups of krill. Despite the apparent ever present seemingly overwhelming presence of predators, krill can manage a lifespan of up to seven years, some of them at least. Krill rise and fall in the water column depending on the time of day. They generally rise to feed in the night-time hours which may be darkness or at least a little less light intensity in mid summer with 24 hour daylight. During the day, they fall back into deeper water again (a few hundred meters) by "parachuting", holding their appendages out and slowly falling. There have been attempts to catch krill commercially and great factory ships have been sent down to the Antarctic by some nations to catch and can krill quickly. Fortunately for the krill and the Antarctic ecosystem , krill go off very quickly after being caught, the Antarctic is a long way away and consumer interest remains fairly low (krill aren't very nice for people to eat). Krill is harvested by the Norwegians with smaller amounts by Japan, Russia and other nations. Around 210,000 tonnes per annum as of 2011 is harvested. Krill is used mainly in aquaculture and aquarium feeds (as fish food) and also in the pharmaceutical and health foods industry. The most effective way of catching krill so far devised are the great baleen plates of baleen whales, such as Blue, Right, and Fin whales. These baleen plates were the original "whalebone" (actually not bone at all but keratin, the same stuff that hair, fingernails, hooves and rhinoceros horns are made from) hanging in two rows from the roof of the baleen whales mouth. The whale skull has an upper jaw that is a long straight structure sticking straight out from the "brain case" up to 10-12ft (3-3.5m) or more long in right whales. The baleen plates make a sort of triangular "tent" the floor of the tent is the lower jaw and the large tongue is inside (the tongue of a large blue whale can weigh as much as an adult bull elephant). The baleen whale takes a large mouthful of sea water and krill with its mouth open, it closes its mouth and then forces excess water out with its tongue. The baleen plates are filters that let out water and small plankton but retain the larger plankton such as krill which are then swallowed. Different whales feed at different depths and their filters are arranged slightly differently so they do not all compete for the same sized krill. One feeding technique of some larger baleen whales is "bubble netting". The whale, or sometimes two working in a pair, dive down below a dispersed krill swarm. They then swim upwards in a spiral blowing air bubbles as they go. The bubbles cause the krill to panic and swim inwards so concentrating them into a smaller space. The whale then swims directly up through the middle with mouth wide open taking in a huge mouthful of krill and water that the baleen plates then filter. One reason for the success and great abundance of krill is that they are very efficient feeders. Their filtration apparatus consists of fine hair-like structures called setae, which them selves have smaller setae coming off them. These can be seen in the electron micrograph to the right. 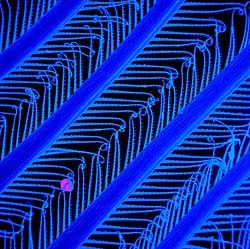 The small pink object caught in the finer setae is about 1 micrometer across, the size of a bacterium, this is as small an object as any filter feeder in the oceans is able to capture and far smaller than the majority can mange. Compare this 1 micrometer object to the size of the phytoplankton in the image of typical phytoplankton at the bottom of this page. The total area of setae that an individual krill has is about 7500 times larger than shown in this picture. Usually in pictures of krill, it is possible to see a green area just behind the head of captured phytoplankton, yet to be digested. In the winter months krill feed under seasonal sea ice. Somewhat surprisingly, the underside of sea ice is often quite strongly coloured green/brown due to the phytoplankton that grow there despite the relatively low levels of light that are able to penetrate. Krill use the ends of their feeding appendages that have scraping setae rather than net-like setae to scrape off and eat the phytoplankton from the ice. 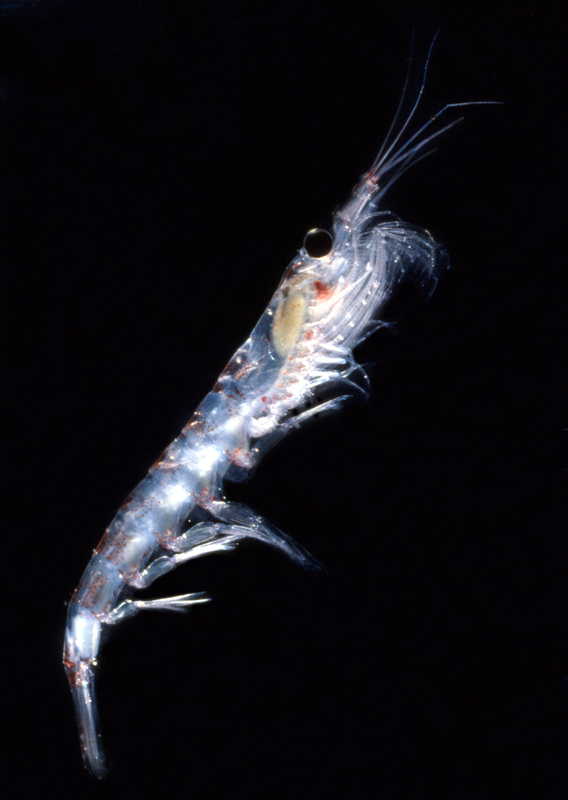 Krill and other Euphausids have a somewhat unusual ability amongst animals with exoskeletons in that they are able to shrink at a moult rather than grow if the food supply is very low for a extended time as it may well be in the Antarctic winter> this can happen after as little as seven days starvation and is thought to be an important method by which krill survive the seasonal fluctuations of food in Antarctica while being able to quickly feed and grow again when the seasonal abundance of phytoplankton arrives. Estimates of krill are difficult to make, krill research is ongoing and moves quite slowly as krill are difficult to study effectively. They are small delicate animals easily damaged by nets, swarms can be widely dispersed and they may be anywhere in the water column down to around 400m depth depending on the time of day. To study krill, you need ocean going vessels able to work in and amongst ice and sophisticated fishing and sonar equipment. Recent studies have indicated that rather than all krill around Antarctica being essentially the same, they may well be composed of a number of separate and distinct populations, this means that they cannot be considered as a single entity when considering fisheries limits or investigating other ecosystem dynamics. Summer distribution range of around 19 million square kilometres. Total number of krill in the region of 8 x 1014 individuals, that's an 8 followed by 14 zeros, 800,000,000,000,000 or 114,000 each for every one of the 7 billion people on earth. Krill standing biomass of 379 million tonnes. The production of krill is in the range of 342 to 536 million tonnes per year, this is the amount that is available to predators and is the result of growth and reproduction and explains the apparent anomaly whereby more krill are consumed per year than the standing biomass. Some studies have indicated (2004) that stocks of krill in Antarctica may have declined in recent years at least in some areas. The reason for this is likely to be a fall in the amount of sea ice in the winter months particularly in the Antarctic Peninsula region. The decline in krill may in turn account for the decline in the numbers of some penguin species. "This is the first time that we have understood the full scale of this decline. Krill feed on the algae found under the surface of the sea-ice, which acts as a kind of nursery. The Antarctic Peninsula, a key breeding ground for the krill, is one of the places in the world where there has been the greatest rise in temperatures due to global warming. This region has warmed by 2.5°C in the last 50 years (much more than the mean global rate), with a striking consequential decrease in winter sea-ice cover. We don't fully understand how the loss of sea-ice here is connected to the warming, but we believe that it could be behind the decline in krill." There are commercial implications as well as scientific ones. The Southern Ocean is a valuable fisheries resource, many of the species caught feed on krill. Thousands of tourists are also attracted to Antarctica to enjoy the spectacular wildlife, most of which feed on krill. There has been previous speculation that krill stocks might have decreased, based on smaller more localized surveys over shorter time periods. This new finding comes from data from nine countries working in Antarctica who pooled their separate data covering 40 Antarctic summers, in the period between 1926 and 2003. This is the first time such a large-scale view of change across the Southern Ocean has been seen. Another animal that feeds on the same phytoplankton food as krill, jelly-like colonial animals called salps that drift in the ocean currents have increased in the same time the krill have decreased. This decline in krill will also make it more difficult for the great baleen whales to return to pre-exploitation levels following their decimation in numbers during the years from approximately 1925-1975. Reference: A. Atkinson, V. Siegel, E.A. Pakhomov, M.J. Jessopp & V. Loeb (2009). "A re-appraisal of the total biomass and annual production of Antarctic krill" Deep-Sea Research 56: 727-740. Picture credits, copyright pictures used by permission: Krill filter - Gerd Alberti & Uwe Kils, Creative Commons Share and Share Alike 3.0 Unported license.